Article provided by Roberto Baldassari. The time and place is Space: 1999 as Alpha Base Commander Koenig recalls his close encounters with Steven Spielberg, Star Trek and other Missions Impossible . If actor Martin Landau had made a different choice in 1965, who knows how television history would have changed. He was offered two roles a master of disguise working for an elite intelligence team, and a pointy-eared, emotionless alien science officer on a spaceship. He chose the spy, and joined Mission: Impossible , and turned down the chance to play Star Trek 's beloved Mr. Spock, a role which propelled Leonard Nimoy to worldwide fame. "I can't play wooden," Landau says. "It's the antithesis of why I became an actor." But Nimoy could play spy, and later stepped in as disguise master Paris when Landau stepped out of Mission: Impossible . Such are the twists and turns of fate Landau has weathered in a varied career that encompasses both movies and television, and has given him the chance to work with such stellar names as Alfred Hitchcock, Richard Burton, Joseph L. Mankiewicz, Cary Grant, John Sturges, Edward G. Robinson and Steven Spielberg. He is perhaps best known to science-fiction fans as Commander John Koenig in Space: 1999 , the 1975-77 syndicated series produced in England and co-starring his wife Barbara Bain. It followed the adventures of several hundred people trapped on the Moon, which had been blasted out of Earth orbit and into deep space by an explosion of nuclear waste. It was, at the time, the most expensive series ever produced. While it dazzled viewers with state-of-the-art effects, it bored critics, who complained about stiff acting and incoherent scripts. But the fans haven't forgotten it and, in another twist of fate, Landau is enjoying-like Nimoy before him - cult status for his work in a short-lived SF series. " Space: 1999 fans are probably more diehard than Star Trek fans. They are amazing. The show had an enormous following. And when I say enormous, I mean enormous," the actor says. "First of all, it's still playing in about 50 countries around the world. It's very popular everywhere. This is the only country in the world where it didn't go network. Just a few years ago, Barbara won the Bravo award as most popular actress in Germany for Space: 1999 ." In America, the series received more jeers than cheers but Landau steadfastly maintains, as do his fans, that "it was a much better show than people realize. We hit some, we missed some, we tried things." The series' first season followed the example set by 2001 , opting to take a minimalist approach to the characters, who wore unisex outfits, and to the vast, stark sets so as to accentuate the majesty and alienation of space. In the second year, they adopted Star Trek as their role model and even hired one-time Star Trek producer Fred Freiberger to guide the transformation. Minimalism was utterly abandoned, as were the unisex outfits and the electronic soundtrack. The sets were smaller and more colourful, characters exchanged banter and even grins, and an alien science officer able to transform into various creatures was added. Landau can debate the distinctions between the two seasons of Space: 1999 with the same detail and fervour as the show's fans. "I liked the first season better," he announces. "It was truer. They changed it because a bunch of American minds got into the act and they decided to do many things they felt were commercial. I think the show's beauty was that it wasn't commercial, it had its own rhythm. I felt the episodes we started with in the first season were much more along the lines I wanted to go. To some extent, that was corrupted. " They should have left well enough alone, he believes. Space: 1999 just hadn't hit its stride. "I felt that it would grow. Episodes like the Christopher Lee show ["Earthbound"], "Black Sun," and "War Games'"were ones with ideas and integrity," he says. "Fred ] Freiberger helped in some respects, but, overall, I don't think he helped the show, I think he brought a much more ordinary, mundane approach to the series. Space: 1999 had a style of its own, a feel of its own, a look of its own, that would have grown if it had a been left alone. It needed time and wasn't given that time. They rushed the process. If the format hadn't been changed, I know it would have hit." The show didn't die from lack of viewership or the critical volleys. It was sunk by the Titanic. "We got sacrificed," Landau declares. "Lew Grade who owned the production company was getting into the motion picture business and it turned out his advertising budget for his films, like Raise the Titanic , was our total budget for another season. It would have served them, from a syndication point-of-view, to have another season, but it came down to economic priorities. I think there was a very good chance of our going another season if he hadn't gotten into movies and needed that money." 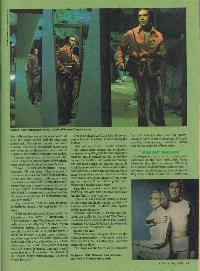 Fans like to spread rumors that Space: 1999 will, like Star Trek , be resurrected as a feature film. It won't happen.
" Star Trek was ahead of its time, so much so the world has finally caught up with it," Landau comments. "I don't think Space: 1999 is quite the same." Mission: Impossible is. Paramount Pictures, the studio that launched Star Trek on the movie screen, and producer Ed ( Witness) Feldman (STARLOG #95) are planning a big screen version for summer 1987. "The times have changed. 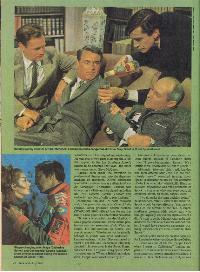 When we did Mission: Impossible , it was much more fiction than it is now," Landau says. "We were ahead of our time. " The movie will star Peter Graves and a new team of characters while featuring appearances by many of the original cast. It's quite possible, Feldman says, that both Landau and Nimoy could be offered roles. He began his career at 17, working as a cartoonist on the New York Daily News, where he illustrated the column " Pitching Horseshoes " and did various comic strips. "I saw many people doing what I was doing and they were in their 30s and 40s, I knew that wasn't for me. " He resigned and tried acting. He was one of two people among the 2,000 that applied to the Lee Strasberg Actor's Studio to be accepted that year-the other was a man named Steve McQueen. Landau soon made the transition to professional theater and into the then-new medium of television. Alfred Hitchcock spotted him and cast him as a villain in North by Northwest . Thereafter, Landau was typecast as a villain until he played an Indian on TV's General Electric Theater and suddenly "got lots of calls to play Indians." Numerous film and TV parts followed and, after guest-starring in an Outer Limits episode, series producer Joseph Stefano offered him the starring role in a new pilot for CBS entitled Haunted . "It was a wonderful, wonderful pilot. I was a psychic consultant, whose actual profession was the restoration of old Victorian homes. His sub-vocation, or hobby, was psychic research. Whether or not he actually believed in ghosts was never addressed," Landau explains. "Robert Stevens started to direct it, got sick, and Joe Stefano ultimately directed it. It never aired in the United States, but when I was in England doing Space: 1999 , it showed up on TV on a British anthology show. People were knocked out by it." Haunted still has never been shown on these shores-outside of Landau's living room. "I have a 16 mm print, " he says. "It's a terrific show, it scares the hell out of people. " Although Haunted didn't sell, Landau was soon offered Star Trek . He has "absolutely never" regretted turning down Spock, a character he saw as "the antithesis of why I do what I do" while Rollin Hand on Mission: Impossible was "the antithesis of Spock, a character who was everybody, all emotional levels, all colors, shapes, sizes. "I would make the same decision today," he announces. "But I knew if the show hit, Spock would be very effective. You have to think of the turmoil of the '60s. A superintelligent creature with pointy ears who thought logically was exactly right-except I didn't want to act it. I did not want to be saddled with the role of a character without feeling. I would have become a newscaster. Actually, newscasters are more emotional than Spock." Besides, Rollin Hand was created expressly for Landau by writer/producer Bruce Geller. "Bruce was one of the first people I met when I came to California," Landau explains. "He was a writer who wanted to learn about actors so he took an acting workshop. I was in it, Jack Nicholson was in it, so was Harry Dean Stanton, Bobby Blake, Shirley Knight, Warren Oates and Robert Towne. We studied together for three years. " The character was originally called Martin Land, but the actor convinced Geller that was overkill. Rather than retype the script, they used a little white-out and a pen and Martin Land became Rollin Hand. "Bruce originally wrote Mission: Impossible as a feature film. We were bad guys, not good guys, it was very much a Rififi-type film, a French caper movie," Landau says. "We were experts, but we pulled off a caper that was less than on the side of angels. He wrote that as a film but couldn't sell it." He managed it. And created a classic. At first, Landau chose not to be a regular and appeared under the billing "special guest appearance. " Although the role was created for him, the actor wasn't entirely comfortable with the idea of being tied down to a weekly series. "I wanted to be able to get out with two weeks notice at any time. I wound up doing 26 out of 28 shows. The next year I signed to do it because I was having a good time," says Landau, who later contracted for a third season. "The first season, when Steven Hill starred, we did 18 great shows that would hold up as films. We probably did 12 the second year and 10 the third year." Then, Desilu sold out to Paramount and the gradual decline in quality became a sudden plunge. "Paramount wanted to make it better, cut down the shooting schedule, pay less for scripts, less for actors, less for directors and they took the show away from Bruce Geller, " explains Landau, who balked at returning for a fourth season. "They spread lies that I wanted ridiculous amounts of money. That's not true. They were destroying the shows. An elevator can only go so high before it goes down. I thought it was going down." Mission: Impossible limped on for four more years and suffered through numerous cast changes, though Graves, Greg Morris and Peter Lupus stayed for its entire run. In the days after Mission: Impossible , Landau remained very busy doing occasional films such as Meteor and guest shots in various TV series. He says he was offered the leads in such series as The Monroes , Banacek , Cool Million , High Chapparal and, with Bain, McMillan and Wife , but turned them all down. "I've always been very particular about doing a TV series," he observes. "It's a marriage. It had better be something you really want to do." He eventually did agree to star in a pilot, entitled Savage , that cast him as an investigative TV reporter and Bain as his producer. The 1973 entry was written by William Link and Richard Levinson, the team who would later create such hits as Columbo and Murder, She Wrote . The director was a young man named Steven Spielberg. "We had to fight to get Steven. I literally walked out of [MCA President] Sid Sheinberg's office - I said, 'No Steve, no Marty and Barbara.' I knew it was a talky show and we needed a film head. It was the kind of show that needed an innovative filmmaker. And I liked him. I said, 'Look, you've got half-a-dozen pilots and you don't care which ones get on and I do. I want Steve, ' " Landau recalls. "l left Sheinberg's office and went to the elevator and he chased me down the hall and said, 'OK, you got him.' " But it didn't sell the series. NBC passed. "It was ahead of its time. That show would have been a platform in which to do intelligent television. It was innovative as hell at the time and we got shot down for the wrong reasons. The network news department took exception to the show," he says. "I got a call from Sid Sheinberg the day after they screened it at [producer] Jennings Lang's house. Sid said, 'It's the best thing we've got, NBC is crazy about it, it's on the air.' And it went from there to being buried in a week's time. " 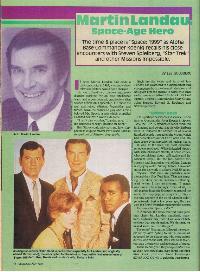 Most recently, Landau was in CBS' new Twilight Zone , starring with Charlie Martin Smith (STARLOG #91) in " The Beacon ." "It was not one of the better ones, but it was fun to work on," remarks Landau. "I was doing Kung Fu: The Movie when they called and said they wanted me for Twilight Zone . Ironically, I had two days off. I worked it out. "Gerd Oswald, the director, said, 'It's a difficult episode, I want something real and strange from that character. You are one of the few people I know who can bring me what I want. It needs help. ' You pretty much knew where the episode was going. But those are the ones that are hardest to do. Things that are written well are a piece of cake. " Landau was no stranger to The Twilight Zone . He was in the second original Twilight Zone ever shot (" Mr. Denton on Doomsday ") and later did another episode, "The Jeopardy Room," directed by Richard Donner. Working on the new Twilight Zone , he says, isn't so different than the old one. "I did feel like I was working on Twilight Zone this time, " he says. "I mean, Rod isn't there, but you've got guys like [then-creative consultant] Harlan Ellison riding herd. It's not just whipped out carelessly." Landau is currently riding herd on his own science-fiction project, a musical stage play that he's co-writing and will direct. "It's called Reach for the Stars . We did a presentation for backers and we're in the process of rewriting the book. We hope to go into the Westwood Playhouse [in Los Angeles]," says Landau. "It's about a guy who lives in a society run by machines, which were there to help people and took over. Everyone lives comfortably, things are going well, and this guy sees some lights in the sky and he starts asking questions, but no one will talk. "But he's curious, goes home and plays with his home computer and winds up finding out it's aliens. He's brought before Megabrain, who runs the society and they tell him to cool it, and he tells Mega off. Then, he's exiled into space with his wife, his computer, and his son for a series of adventures." Martin Landau has no special interest in science fiction but has an affinity for "anything I think is intelligent, dramatic, theatrical and entertaining," he says. "And I think science fiction is all those things."